For the last day of bookmarked recipes this session, here is another version of ginger chutney which we loved. In a heated pan, add 1/2 tsp of cooking oil and roast the chana dal, urad dal and red chilies. Upon cooling, grind the above mixture along with tamarind, powdered jaggery and ginger. Add as much water as needed to make a fine paste. In a heated pan, prepare the seasoning by heating the oil and adding mustard seeds, asafotida and curry leaves. Add the seasoning to the chutney and serve it as an accompaniment to idli,dosa, pesarattu or plain rice. Check out the Blogging Marathon page for the other Blogging Marathoners doing this BM#84. We all are traditionally used to eating Paan/beeda with fresh betel leaves after a hearty meal. The ingredients in the paan aid in digestion, acidity and gives an overall sense of well being. To take this to another level, I made these paan bites after I tasted a store bought version of the same. I played around with the ingredients a little and found that we don't care of coconut powder too much and so I have sparingly used it when I made it the second time. I felt coarsely ground cloves would add a kick to the sweet paan bites but my other half didn't like the idea. Coarsely crush the paan leaves using a mortar and pestle and set aside. Mix all the ingredients in a bowl, adjust the coconut powder as needed to make sure the mixture is not too sticky. Pinch a Teaspoon of the mixture and roll into tiny balls, roll on the coconut powder and set aside. Continue with the rest of the mixture. I made about 12 tiny bites. Note - If the Gulkhand is not soft enough, place it in a bowl of hot water or microwave it for a few seconds to make it soft. Check out the Blogging Marathon page for the other Blogging Marathoners doing this BM#84.. This week I shall post some of the bookmarked recipes from my 'magic folder'. There are a lot of recipes which I bookmark frequently and try them out at random times. I make sure I record it, take pictures and tuck them into my magic folder. I guess that is what most of the bloggers do as well. These scones have a special place in my heart as I love to cook with coconut milk. Though the taste of coconut milk is masked in these scones, they turned out super fluffy and addictive. In a mixing bowl, combine flours, baking powder, sugar, salt, and butter and mix well until it resembles bread crumbs. Add blueberries, lemon zest and coconut milk until a soft dough forms. Pat the dough into a 7-inch round onto a parchment lined baking tray. Cover it and refrigerate for 15 minutes. Cut the chilled dough into 8 wedges. Sprinkle each scone with a good amount of the sugar and bake until raised and golden, about 23-25 minutes. Since we have discovered our love for Schezwan sauce, I felt that it was high time to make the sauce at home. I found various versions of the sauce with different ingredients all over the internet but I looked at the list of ingredients from a store-bought bottle and added my own spin on it. I used this sauce to make a Schezwan fried rice. My family decided that this homemade sauce turned out to be more flavorful than its store-bought counterpart. In a bowl of hot water, soak the dry red chilies for 15-20 minutes. Drain and reserve the water. Grind the red chilies into a fine paste without adding any water. Set aside. In a heated pan, add oil and saute the garlic and ginger until fragrant. Make sure not to allow them to brown. Add in minced celery and saute for a few seconds. Add in the red chili paste, mix well and allow to cook until the oil oozes out. Add a tablespoon of water each time and stir continuously until a thick saucy consistency is achieved. I had to add about 1/2 cup of water. Next goes in the tomato ketchup, salt, sugar, cinnamon powder, cloves powder, pepper powder, sesame seed powder and cumin powder. Cover and cook for a few minutes until the water is evaporated and the oil floats. Remove from heat, store in a clean and dry bottle. This week I am showcasing some dips and chutneys to jazz up the menu. This post was lying in my drafts since last summer. We had an abundance of tomatoes and mint in our backyard and so I made this combination which we enjoyed through out the summer. In a heated pan, add oil and the ret of the seasoning ingredients. After the dals brown and the mustard seeds splutter, saute the mint and green chilies. Add the chopped green tomato, mix well. Cover and let the green tomatoes cook through. Sprinkle salt and turmeric. Mix well. Remove from heat. Add the sliced garlic cloves if using. Add coriander leaves if using. Grind into a fine or coarse paste as per preference. Serve with steaming hot rice and ghee! 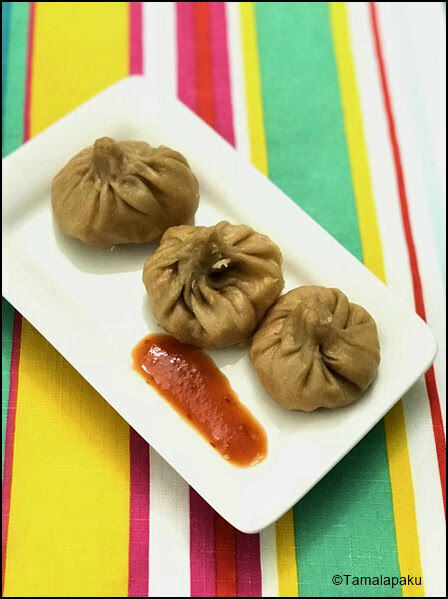 The Whole Wheat Vegetable Momos which I posted last week have been widely appreciated and but for this chutney, it would have been a rather dull and bland affair. To perk up the momos, this chutney is a must have as an accompaniment. Be warned that it is definitely not for the faint hearted, so to say. It is as fiery as it looks in the picture. In a microwave safe bowl, make a couple slits to the tomato, 2 red chilies, a couple tablespoons of water and zap in the microwave for a couple of minutes. When it is safe to handle the tomato, peel the skin and blend the boiled tomato, red chilies and add a garlic clove. Transfer into a serving bowl, add salt, sugar and vinegar and mix well. Adjust the flavors as needed. In this series of steamed meals, today's idlis were a surprise. They were instantly liked at home. These idlis are rice free as well, if we can excuse the use of Beaten rice/Poha. The batter fermented very well and the idlis were soft and fluffy. Wash and soak cracked wheat, urad dal, fenugreek seeds and poha for 4-5 hours. Drain and grind into a fine batter. Add salt and set aside in a warm place for fermentation. After a few hours when the batter has risen, mix well and pour the batter into the idli moulds and steam for 15 minutes. Remove from heat and serve with chutney of your choice. Vegetable Momos are a craze in many parts of India and has become an integral part of the street food scene there. It is such a simple idea to eat a healthy meal with fresh vegetables and crisp flavors. Accompanied by a spicy chutney (the recipe will be posted shortly), it makes a delightful snack/appetizer. I have tried to make it healthy by making the wrapper at home with whole wheat flour. But I am told there are some egg free momo wrappers available in the market. Also there are many variations and possibilities and I am sure each of them would be just as delightful. I made these on a wintry evening not confident that my family will enjoy these. I realized I had under estimated them as I barely had one momo to taste. The little one found them too spicy to her taste. It is slowly becoming a delicate dance trying to balance the taste buds of the spice lovers and the bland food lovers. 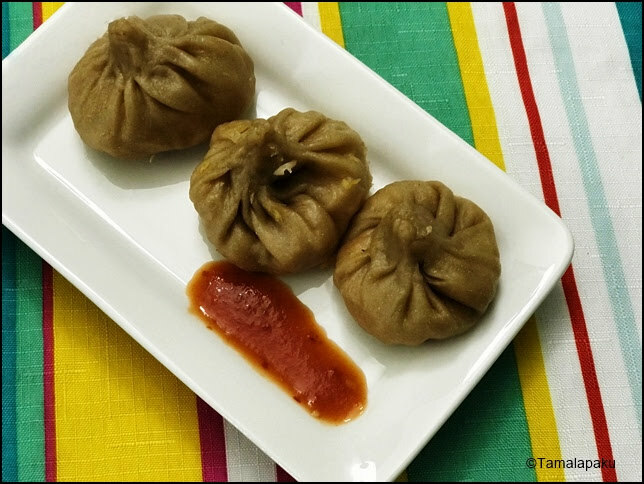 Note to self - Make the momos bland and the chutney spicy to achieve harmony at home :). In a mixing bowl, add wheat flour, salt and warm water and knead into a soft dough. Cover and set aside for 15-20 minutes. In a heated pan, add oil and saute the green chilies, ginger and garlic for a few seconds. Add in the vegetables and lightly saute them making sure they retain their crispness. Allow the stuffing to cool while working on the dough. Pinch a marble sized dough and roll out like a roti. Put a tablespoon of filling in it. Close the edges like a frill and gather the pleats to the center and seal. Pinch off the extra dough in the center if needed. Continue till all the momos and similarly done. Transfer them into a greased steamer basket. Steam for about 10-12 minutes and check if they appear glossy. Allow them to sit in the steamer for a few minutes. Serve warm with the spicy momo chutney. Idli is a part of a typical South Indian life style and we are proud to fall in that category. There are varieties of Idlis which we can make and enjoy. One such variety in an attempt to avoid rice is this Urad-Moong Dal Idli. 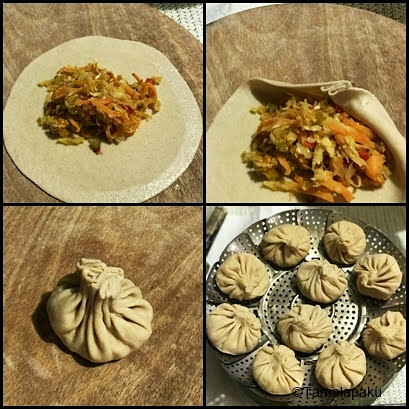 This week I chose to highlight some steamed dishes which we enjoy at home. I tried the idli without the vegetables and the seasoning but I felt the moong dal left a vague after taste which I didn't care for. So I would recommend not to avoid the seasoning. Wash and soak the Urad Dal and Moong Dal for 3-4 hours. Drain and grind into a fine batter adding as little water as needed. Add in the washed and drained Idli rava and mix well. Sprinkle salt into the batter and set aside in a warm place for fermentation. When the batter has fermented enough, prepare the seasoning. In a pan, add oil and the rest of the seasoning ingredients. After the mustard seeds pop and the urad dal is lightly browned, add in the vegetables and saute them for a few minutes. Add the above mixture into the batter and mix well. Arrange a cashew in each of the idli moulds. Pour the batter into the idli plates and steam them for about 15-17 minutes. Unmould the idlis and serve with a chutney of your preference for a filling meal. To conclude this series on sweet flatbreads, here is a traditional bobbattu from the coastal region of Andhra Pradesh. I used the split moong dal with skin and so the filling turned out slightly darker in shade. Also the jaggery contributed to the color. The coconut definitely added a new dimension to the flatbread. Wash and boil moong dal either in the pressure cooker or on the stove top until it is just tender. Drain the extra water and let the cooked dal cool. Meanwhile heat the powdered jaggery with about a tablespoon of water until it melts. Pass the jaggery solution through a metal tea strainer and discard the impurities. Add the jaggery solution to the boiled moong dal and grind in a mixer to a fine paste adding cardamom powder. It should result in a stiff dough. If it is runny, heat it and let the extra moisture evaporate. Let it cool. Divide the dough into equal parts (about 6) and roll each portion of the dough into small circles. Put in at least a teaspoon of filling and close the edges. Continuing the series on sweet flatbreads, here is my personal favorite, Paneer Khoya Bobbattu. If readymade kalakand is available, it would work just as well. the consistency of the filling was a little uncomfortable to work with initially. But I refrigerated it for a while and it made my life a tad better. In a mixing bowl, add the khoya, grated paneer, cardamom powder and sugar. Mix well and knead into a smooth mixture. If the mixture turns out a little soft, refrigerate it until needed. In a mixing bowl, knead the whole wheat flour with water and a little salt into a soft dough and keep it covered for 10-15 min.